Kitchens are multi-purpose harbors, used for everything from preparing meals to a family gathering spot to hosting guests. While we often do appreciate the many practical purposes that kitchens can provide our households, many of us still tend to take for granted the use of space and many practical purposes our kitchens can provide for us. Whether you’re looking to add extra storage, display items in a unique way, or create specific methods of placing certain items in your homes, implementing the right kitchen cabinet accessories can be incredibly beneficial for your home. However, choosing the right accessories is only half the battle – you’ll also have to find unique ways of incorporating them into your kitchen design, weighing the best options to maximize efficiency, while preserving your overall aesthetic. So here are the five kitchen cabinet accessories that you should consider implementing into your next design or remodeling project. Installing either a single or series of drawer systems into your kitchen is a great way to maximize space while utilizing new kitchen cabinet accessories. A drawer system can add a lot of much needed space to any kitchen, allowing room for storing extra food or items that are currently overflowing in your kitchen. Utilizing these kitchen cabinet accessories also adds a level of depth unmatched by most standard kitchen designs, offering a completely unique and versatile approach to storage. Hang pots and pans in a pullout unit that allows easy access to all of your cooking hardware; Organize your pantry so you can always see what stock you have on-hand; or keep your food storage containers nicely organized and easily accessible. If you like to have things organized, orderly, and on-hand in your kitchen, drawer systems are a must-have! When considering all of the benefits that this kitchen cabinet accessory can add to such an important room, your drawer system will pay for itself in no time. Become organized today, and seek out a drawer system for your next kitchen remodel project – a skill and project that Kitchen & Bath Unlimited has provided home owners for decades. Are you looking for kitchen cabinet accessories that can help to both add additional storage to your kitchen, as well as make the most of high ceilings that exist in your home? If so, you may want to consider installing tall unit-style storage in your kitchen. With a variety of designs, implementation methods, and flexibility to serve a number of needs in your kitchen, tall units are a great way to maximize your kitchen’s storage potential. Whether you’re looking for a new pantry or broom closet, or simply seeking a way to maximize overhead storage, tall units can be incorporated into your kitchen design in various ways. When considering adding tall unit, make sure you keep Kitchen & Bath Unlimited in mind for your next project. We have the experience and knowledge to implement to provide storage solutions for your kitchen that are both practical and match your design. Pull outs are a popular, highly sought after kitchen cabinet accessories that offer a unique approach for storing kitchen items such as crockpots, mixers, pots and pans, and food items. These accessories help you better organize your kitchen by adding not only more storage space, but a better way of accessing all of your kitchen items. Glide out shelving helps you convert your cabinets to practical usable space – no more under-utilizing the deep recesses of your cabinets. You paid for the square footage, use it! Thanks to the skill-set and flexibility of Kitchen & Bath Unlimited, pull outs can be implemented with ease as part of your next kitchen remodeling project. We provide careful craftsmanship and tailor unique design options that are sure to not only increase your storage capacity, but also improve accessibility of kitchen items. Often times, organizational needs are specific and necessary to a kitchen remodel or redesign project, so when it comes to spending money on renovating your space, why spend more for accessories that you may not use? This is why when it comes to kitchen cabinet accessories, cutlery trays are an excellent addition – you will use them! A cutlery tray is just what it sounds like: a method of organizing your silverware and utensils that maximizes the amount of space in your drawers and provides quick and easy access to whatever you are looking for. Cutlery trays come available in a variety of sizes and designs to fit the dimensions of nearly any cabinet. 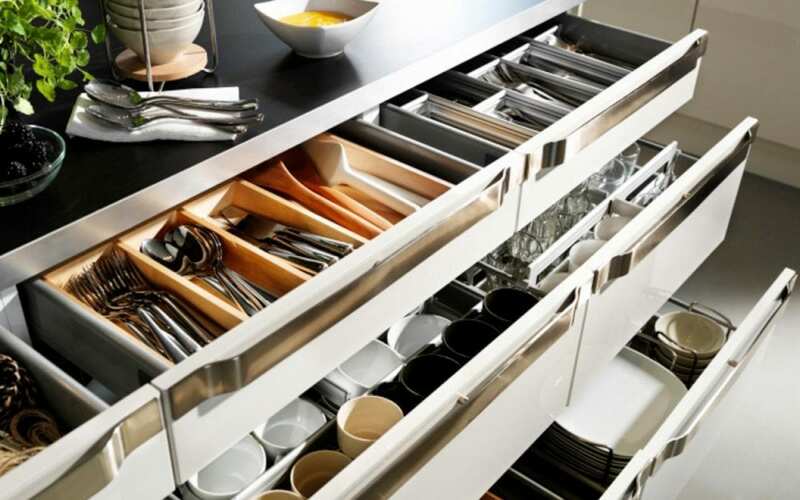 Further, if you can’t find one that fits your needs, look no further than Kitchen & Bath Unlimited to design, build, and install a custom cutlery tray that perfectly meets your needs. Organize your silverware, have all of your cooking utensils right at your fingertips, be better organized and conserve space with cutlery trays – kitchen cabinet accessories that you will surely use and appreciate every day. Finally, if you’re looking for a kitchen cabinet accessory that finds a way to incorporate tricky corners – typically seen as a dead zone for utilizable space – you may want to explore the various corner solutions available. To address corner kitchen space, most people tend to simply add corner shelves or a lazy-Susan feature within a corner cabinet that helps maximize the space. However, other kitchen cabinet accessories can be implemented within a corner solution, such as a pull out cabinet that allows for improved access for hard-to-reach areas of a pantry or storage unit. With multiple hinge options and design flexibility, a corner solution is incredibly simple and easy to use – just as long as you have the necessary knowledge and experience on your side when putting the project together. No worries! The design experts at Kitchen & Bath Unlimited have the knowledge and experience to handle all of your corner solutions issues. Whether you’re looking for more storage space in your kitchen, better organization, or just a new look to shake things up in your home, adding kitchen cabinet accessories is a great way of checking off all of these boxes. Be it a drawer system, tall unit, pull out cabinet, cutlery tray, or new corner solution, the possibilities for improving your storage and overall efficiency in your kitchen are endless. When you’re ready to incorporate one of these kitchen cabinet accessories into your kitchen design or renovation, call on Kitchen & Bath Unlimited to partner with you on your project. With decades of accrued knowledge and experience in kitchen design, our craftsmen guarantee quality and deliver beauty (yes, even a cutlery tray can be beautiful!). It’s important to remember that kitchen design should be as concerned with making your life easier as it is with making your space beautiful. Kitchen & Bath Unlimited will give you the best of both worlds! Call us today at (269) 375-2212 to talk to one of our friendly design experts about adding kitchen cabinet accessories that are sure to make your life easier. Are His and Her Separate Bathrooms Right for You?